(KIA-POW) 27 August 1944, mission #233 to Esbjerg, Denmark, in B-17G #43-37629 No name (360th BS) PU-A. The aircraft was flying in the No.1 position, low Squadron, Low Group. It received a direct flak hit in the fuselage just back of the wings in the target area. It immediately broke in half and fell away in two pieces. 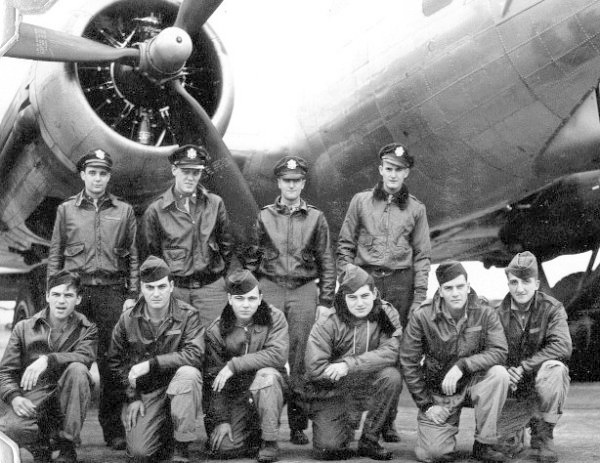 The tail Gunner, S/Sgt M. Birenbach, managed to escape fdrom the stricken B-17 and became a POW. Crew Note: Sgt Leo D. McGovern (WG) was deleted from the crew shortly after their arrival at Molesworth when the crew size was reduced from ten to nine men. He flew no combat missions with the 303rd BG(H).